We are talking about congestion pricing. That’s a fee charged to drivers on peak routes at peak times. It is meant to encourage people to drive at other times or to use public transit and other ways of getting around. Metro CEO Phil Washington has floated congestion pricing in LA County as one way to fund transit projects that are already planned under Measure M but need to be sped up in time for the 2028 Olympic Games. He and transportation expert Michael Manville join DnA to explain congestion pricing, how its applied and whether it’s viable in a region where alternative options are limited and Angelenos assume a right to drive. 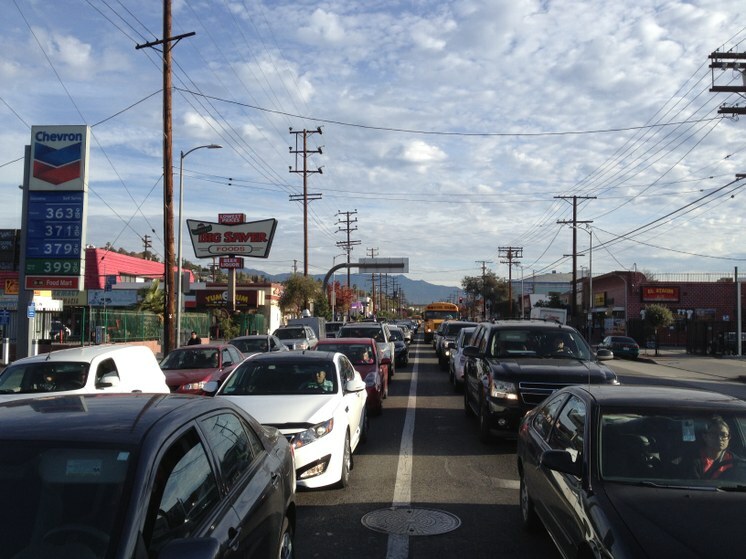 A traffic jam in Cypress Park near Dodger Stadium. Photo credit: Umberto Brayj. But will Angelenos figure out a different way to get around when driving is made so cheap and easy? LA Metro chief Phil Washington explains how he would implement the charge; he responds to the criticism that it is a regressive tax and to whether it might be premature in a region that has such limited alternative ways of getting around.